bus company - for the second time in three years. Well done to Mark and his team. They have also just joined the Optare Solo set with several secondhand examples for West Cornwall operations just arrived - and more new ones due in January. First Devon and Cornwall has meanwhile been highly commended in the Bus in the Countryside category for its joint initiative on Bus Route 41 "Wheal to the Coast" with Cornwall County Council, University College Falmouth and local urban generation company. 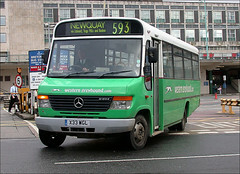 The work to replace the bus stops at Derriford should be complete by tomorrow lunchtime. I have been really impressed at how quickly the work has progressed and how little disruption it seems to have caused to services using the stops. Traffic has been manic as usual during the evening peak - but this is normal and not related to the on going work. The new shelters are great and at last provide a decent waiting area for passengers. It was very dark there last night as there were no lights on either in the shelter or the main lamp posts which I guess was down to the ongoing construction but once they are up and running - and then we can look forward to RTPI - Real Time Passenger Information - instead of the old battered printed time tables we have had to put up with for years! Well done to all involved with the council, JCDecaux and the bus companies.